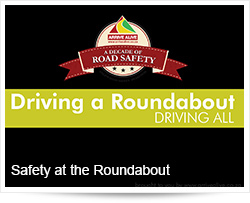 Safely navigating the roundabout or “traffic circle” is a challenge for many drivers. It is especially so when the roundabout is a multi-lane roundabout. Even though much has been written on the Arrive Alive website and road safety blogs on this topic, we believe it may assist drivers to share this from a unique perspective by using the dashboard camera along with a few notes. 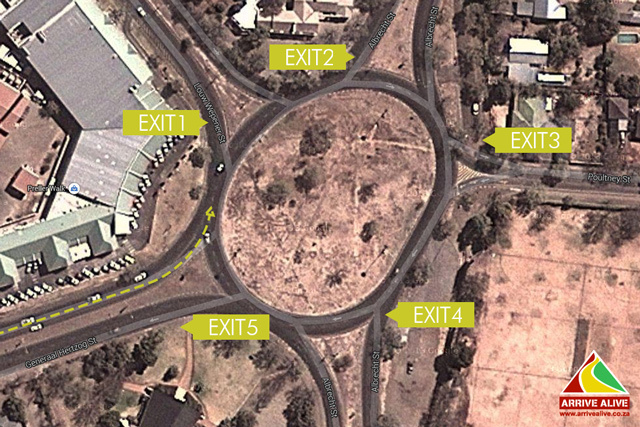 We decided to use a multi-lane roundabout at Preller Square in Bloemfontein and drive from the same direction, exiting at 5 different exits. 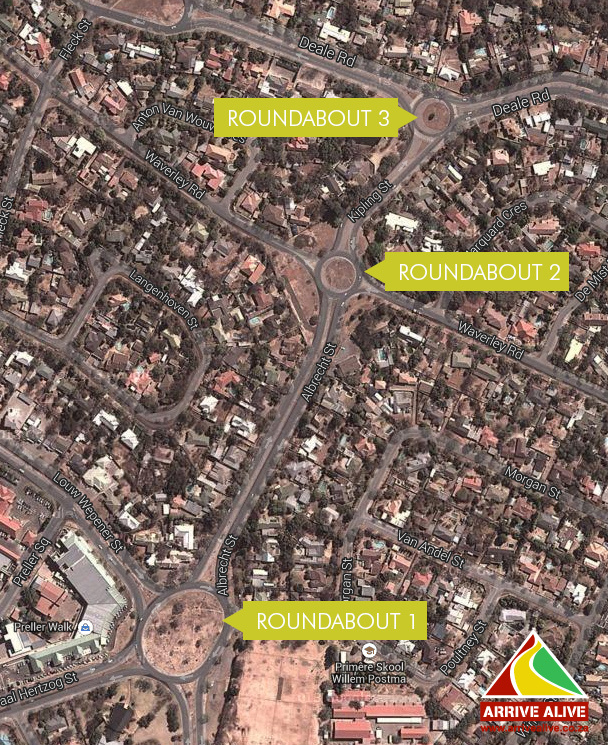 Which types of crashes occur in the roundabout and what are the causes thereof? Rear-end collisions: This may occur where you do not give way to a vehicle already inside the roundabout and the vehicle approaches while you are slowly entering the roundabout. Side-swipe collisions: These are most common and will occur where one vehicle is continuing straight on while the vehicle on the inside of the roundabout exits from the inside lane to the outer lane of the exit. How can we best prevent these collisions? Drive at a moderate speed - roundabouts/ traffic circles are designed to enhance traffic flow - there should be no stopping inside the circle or racing around it! Know where you have to go! Position yourself in the correct lane ahead of the roundabout. As you arrive at the roundabout, traffic coming from your right has right of way – you must stop until there is a break in traffic. Use your indicators for lane changes and where you are exiting. Signal your intent to other drivers when entering, going around and exiting the circle. Obey all traffic signs and road markings – do not cross the barrier lines – including once you exit the roundabout! To exit the circle at any exit after the first one, indicate to the left after you pass the road before the one at which you intend to exit the circle. Once you have indicated to leave the circle, you must leave at the very next exit. The safest way to avoid a side swipe may always be to ensure that you are in the outer lane before taking your exit – then there will be no vehicle inside you to side-swipe you! Be alert and avoid any distractions - you need both your hands on the steering wheel and your eyes on the road and observing traffic. Make no assumptions – do not assume that the other driver to your left is going to exit - or that the driver to your right is going to continue in the inside lane. If you are in the left or centre lane of the traffic circle, look out for vehicles on your right – next to or ahead of you – that are indicating left, and give way to them where it is safe to do so. Keep in mind not all drivers use there indicators as the Rules of the Road require. Keep in mind that buses or large trucks need extra room to make turns and might take up more than one lane in a traffic circle. Even inside the roundabout /traffic circle do not tailgate – keep a following distance to allow yourself the time and space to react! Be alert to drivers in your blind spot! Keep calm - once you miss an exit – avoid swerving at the last minute. Return to the inside of the roundabout and move around once more. When it is not safe to change lanes – it may be necessary to drive all the way round the island again in order to wait for a gap and thereby maintain a clear space around your vehicle at all times so as to minimise the risk of a collision. Important note: Use commons sense as well! Do not drive as if everyone knows the rules of the road!